Dinosaurs (meaning "terrible lizards") are a varied group of archosaur reptiles. They were the dominant land animals of the Mesozoic era. Over 500 different genera of dinosaurs are known. Fossils of dinosaurs have been found on every continent, and there are still frequent new discoveries. Dinosaurs appeared in the Upper Triassic, about 230 million years ago. The earliest date of a dinosaur fossil is that of Utaraptor, 231.4 to 228 mya. By the early Jurassic they were the top land vertebrates, and dominated most environments on land. They continued until the sudden K/T extinction event 66 million years ago. From the fossil record, we know that birds are living feathered dinosaurs. They evolved from the earliest theropods during the late Jurassic. And so they were the only line of dinosaurs to survive to the present day. Dinosaurs had adaptations which helped make them successful. The first known dinosaurs were small predators that walked on two legs. All their descendants had an upright posture, with the legs underneath the body. This transformed their whole life-style. There were other features. Most of the smaller dinosaurs had feathers, and were probably warm-blooded. This would make them active, with a higher metabolism than modern reptiles. Social interaction, with living in herds and co-operation seems very likely for some types. The first fossils were recognised as dinosaurs in the early 19th century. Some of their bones were found much earlier, but were not understood. William Buckland, Gideon Mantell and Richard Owen were scientists who saw these bones were a special group of animals. Dinosaurs are now major attractions at museums around the world. They have become part of popular culture. There have been many best-selling books and movies. New discoveries are reported in the media. 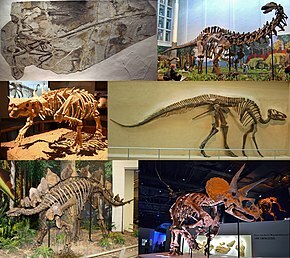 Dinosaurs are united by at least 21 traits in their skulls and skeletons. These common characters (called 'synapomorphies') are the reason palaeontologists are sure dinosaurs had a common origin. However, when definite dinosaur fossils appear (early in the Upper Triassic), the group had already split into two great orders, the Saurischia, and the Ornithischia. The Saurischia keep the ancestral hip arrangement inherited from their Archosaur ancestors, and the Ornithischia have a modified hip structure. The following is a simplified list of dinosaur groups based on their Evolution, it is organized based a the list of Mesozoic dinosaur species given by Holtz (2007). Groups with a dagger (†) next to them don't have any living members. The Archosaurs evolved into two main clades: those related to crocodiles, and those related to dinosaurs. Pseudosuchia: clade of the crocodiles and their relatives. Avemetatarsalia: clade of the dinosaurs, pterosaurs, birds and relatives. Ornithodira: clade of the pterosaurs and dinosaurs. The first known dinosaurs were bipedal predators that were one to two metres long. The earliest confirmed dinosaur fossils include saurischian ('lizard-hipped') dinosaurs Saturnalia 232–225 mya, Herrerasaurus 230–220 mya, Staurikosaurus possibly 230–225 mya, Eoraptor 231.4 mya, and Alwalkeria 230–220 mya. Saturnalia may be a basal saurischian or a prosauropod. The others are basal saurischians. Among the earliest ornithischian ('bird-hipped') dinosaurs is Pisanosaurus 230–220 mya. Although Lesothosaurus comes from 199–189 mya, skeletal features suggest that it branched from the main Ornithischia line at least as early as Pisanosaurus. Early saurischians were similar to early ornithischians, but different from modern crocodiles. Saurischians differ from ornithischians by keeping the ancestral configuration of bones in the pelvis (shown in a diagram above). Another difference is in the skull: the upper skull of the Ornithischia is more solid, and the joint connecting the lower jaw is more flexible. These features are adaptations to herbivory; in other words, it helped them grind vegetable food. Dinosaurs were a varied group of animals. Adaptive radiation let them live in many ecological niches. Paleontologists have identified over 500 different genera and 1,000 species of non-avian dinosaurs. Their descendants, the birds, number 9,000 living species, and are the most diverse group of land vertebrates. The largest dinosaurs were herbivores (plant-eaters), such as Apatosaurus and Brachiosaurus. They were the largest animals to ever walk on dry land. Other plant-eaters such as Iguanodon had special weapons, to help them fight off the meat-eaters. For example, Triceratops had three horns on its head shield, Ankylosaurus was covered in boney plates, and Stegosaurus had spikes on its tail. The carnivores were bipedal (walked on their back legs), though not as we do. Their body was more towards the horizontal, balanced at the back by their tail. Some were very large, like Tyrannosaurus and Spinosaurus, but some were small, like Compsognathus. It was the smaller sized meat-eaters that may have evolved into birds. The first fossil bird, Archaeopteryx, had a skeleton which looked much like that of a dinosaur. Dinosaurs were primitively bipedal: their probable ancestors were small bipedal Archosaurs. The date of the early dinosaur genus Eoraptor at 231.4 million years ago is important. Eoraptor probably resembles the common ancestor of all dinosaurs; its traits suggest that the first dinosaurs were small, bipedal predators. The discovery of primitive, pre-dinosaur, types in Middle Triassic strata supports this view. Analysis of their fossils suggests that the animals were indeed small, bipedal predators. Those dinosaurs which returned to four-legged stance kept all four legs under their body. This is much more efficient than the sprawling legs of a lizard. The big sauropods could never have reached so large a size without their pillar-like legs. A review surveys what we know about the mechanics of dinosaur movement. A major change in outlook came in the 1960s, when it was realised that small theropods were probably warm-blooded. The question of whether all theropods or even all dinosaurs were warm blooded is still undecided. It is now certain (from fossils discovered in China: see Jehol biota) that small theropods had feathers. This fits well with the idea that they were warm-blooded, and that the origin of birds can be traced to a line of small theropods. Warm blooded animals have a high metabolic rate (use up food faster). They can be more active, and for longer, than animals who depend on the environment for heating. Therefore, the idea of warm-blooded dinosaurs insulated by feathers led to the idea that they were more active, intelligent and faster runners than previously thought. Main-stream palaeontologists have followed this view for small theropods, but not for larger herbivores. Since we know that the size of a Stegosaur's brain was about the size of a walnut, there is good reason to think its intelligence was limited. Despite their great success over a long period, there were life-styles which the dinosaurs never evolved. None ever evolved to live entirely in water, as many mammals do, though Spinosaurus was semi-aquatic. They never dominated the small terrestrial niche. All through the Mesozoic most small vertebrates were mammals and lizards. The extinctions at the end of the Cretaceous were caused by one or more catastrophic events, such as massive asteroid or meteorite impacts (like the Chicxulub impact), or increased volcanic activity. Several impact craters and massive volcanic activity, such as that in the Deccan Traps in India, have been dated to the approximate time of the extinction event. These geological events may have reduced sunlight and hindered photosynthesis, leading to a massive disruption in Earth's ecology. Did any terrestrial dinosaurs survive the great extinction event? Several fossils have been found in the Hell Creek Formation about 40,000 years later than the K/T extinction event. 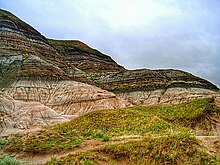 Many scientists dismiss the "Paleocene dinosaurs" as re-worked, that is, washed out of their original places and then re-buried in much later sediments. An associated skeleton (e.g. more than one bone from the same individual) found above the K/T boundary would be convincing, but no such finds have been reported. that tare each other in their slime". Tennyson, In Memoriam,1849. Books about dinosaurs have been popular, especially with children, but adults have also enjoyed these kinds of books. In Edwardian times, Arthur Conan Doyle wrote a novel about a plateau filled with dinosaurs which he called The Lost World. Jurassic Park in 1990 started a new phase in dinosaur popular culture when it was followed by the movie of the same name in 1993. ↑ That is, fossil dinosaurs rather than modern birds. ↑ They may have appeared earlier: Alcobar, Oscar A.; Martinez, Ricardo N. (19 October 2010). "A new herrerasaurid (Dinosauria, Saurischia) from the Upper Triassic Ischigualasto Formation of northwestern Argentina". ZooKeys 63 (63): 55–81. doi:10.3897/zookeys.63.550. PMC 3088398. PMID 21594020. ↑ "Dino Timeline". Natural History Museum. Retrieved 2009-10-05. ↑ 5.0 5.1 St. Fleur, Nicholas (8 December 2016). "That thing with feathers trapped in amber? It was a dinosaur tail". New York Times. Retrieved 8 December 2016. ↑ Lee, MichaelS.Y. ; Cau, Andrea; Naish, Darren; Dyke, Gareth J. (1 August 2014). "Sustained miniaturization and anatomical innovation in the dinosaurian ancestors of birds". Science 345 (6196): 562–566. doi:10.1126/science.1252243. PMID 25082702. http://www.sciencemag.org/content/345/6196/562. Retrieved August 2, 2014. ↑ 7.0 7.1 Holtz, Thomas R. Jr. (2007). Dinosaurs: the most complete, up-to-date encyclopedia for dinosaur lovers of all ages. New York: Random House. ISBN 0-375-82419-7. ↑ Moderately large bipedal dinosauromorphs had appeared by 246 mya. Fossil tracks show that the dinosaur lineage appeared soon after the Permian-Triassic extinction event. Their age suggests that the rise of dinosaurs was slow and drawn out across much of the Triassic. Brusatte S.L; Niedźwiedzki G. & Butler R.J. 2010. "Footprints pull origin and diversification of dinosaur stem lineage deep into early Triassic". Proceedings of the Royal Society B 278 (1708): 1107–1113. doi:10.1098/rspb.2010.1746. PMC 3049033. PMID 20926435. ↑ Nesbitt S.J. 2011. The early evolution of archosaurs : relationships and the origin of major clades. Bulletin of the American Museum of Natural History 352: 1–292. ↑ Wang S.C. and Dodson P. (2006). "Estimating the diversity of dinosaurs". Proceedings of the National Academy of Sciences USA 103 (37): 13601–13605. doi:10.1073/pnas.0606028103. PMC 1564218. PMID 16954187. ↑ Sereno, P.C. ; Forster, Catherine A.; Rogers, Raymond R.; Monetta, Alfredo M. (1993). "Primitive dinosaur skeleton from Argentina and the early evolution of Dinosauria". Nature 361: 64–66. doi:10.1038/361064a0. ↑ A clade of Archosaurs ancestral to all dinosaurs and pterosaurs. ↑ 18.0 18.1 Bakker, Robert T. 1986. The dinosaur heresies: new theories unlocking the mystery of the dinosaurs and their extinction. Citadel N.Y.
↑ Benton M.J 2000. Walking with dinosaurs: the facts. BBC, London, Chapter 6. ↑ MacLeod N. et al. (1997). "The Cretaceous–Tertiary biotic transition". Journal of the Geological Society 154 (2): 265–292. doi:10.1144/gsjgs.154.2.0265. http://findarticles.com/p/articles/mi_qa3721/is_199703/ai_n8738406/print. Wikispecies has information on: Dinosauria. This page was last changed on 11 March 2019, at 16:10.